A NEW issue of The Highland Woodturner is now available for you to read. This month we’ve got a timely column from Curtis Turner on how to turn a door stopper – just the thing you will be wanting to hold your shop door open to enjoy the warm weather! We’ve also got a new Turning Tip from Phil Colson on how to clean up a ragged chuck hole, as well as a great gallery of turned pieces from Diane Davison, a self-taught woodturner. 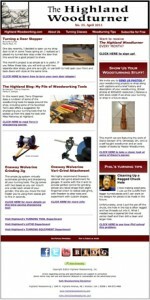 Add to that a new woodturning article by Terry Chapman from the Highland blog and a couple great deals on turning products, and you’ve got the April issue of The Highland Woodturner! Enjoy!